Just a quick reminder for anyone that was interested in applying for the open Judge position: your application must be sent in by the end of the month (this week!). After that your applications are still welcome and you will be considered for open positions in the future, but you will not be eligible for the currently-open slot. Now that it is past the deadline, I was curious if the judges had any inkling on when they'd be able to announce who next joins their ranks. I'd imagine going through the applications alone could take quite some time, not to mention then coordinating among 7 judges to reach a decision. In any case, best of luck to all applicants through the process and I look forward to hearing the result, whenever that may be. Well, it normally takes a while. I've seen it takes months to get everyone to weigh in, debate options, then go through all the necessary approvals. I hope to get it done much quicker than that, but I'm only one of a crowd. I tried, this time, to see if I could apply, but I really don't have the free time to do enough games. I made some games, through, using figures currently in the process. I took photos of those games, and will make full featured battle reports of them, along with my feelings on the figures. Seing the work involved to test figures, I also wanted to thank all the judges (current, past or future) to devote so much time for the community ! Xualtiacan Fire Ants have passed United Fanscape review and march forward in the process. Sorry it took so long to get these announced; we have been waiting for this announcement by our VC partners the C3V. When this version was submitted to the SoV, the C3V version was well along in the process. After a good deal of discussion weighing the various options, we decided the two designs were significantly different and both were worth pursuing. However, the two designs had certain thematic similarities we wished to avoid. As a VC member and the designer of the submitted unit, I felt that the C3V version was a better match for the fire ant theme (from Thormun's Journal, if you were unaware), and chose to re-theme this version. The re-theme was done with the consent and input from the submitter, betawolf36. If this unit makes it through review, we will have two competing ant species crawling around Valhalla. With the alliance dissolved and Valkrill's forces spreading death and destruction through the lands, Einar looked to neighboring lands to gather fresh troops. Einar's empire had long held an uneasy peace with the Red Queen and her kingdom of giant ants in Aunstrom. Some have said that the Red Queen was a normal queen ant that once drank from a wellspring; its magic greatly increased both her size and her intelligence. Her offspring are the size of wolves and unusually intelligent, and have proven to be a formidable force on the battlefield. The Queen herself has learned to speak in kyrie tongues, and knows of the destruction that Utgar has brought to lands like Anund. I am picturing Marcus Decimus Gallus leading a horde of ants... that is made of awesome. wait is the alliance really dissolved? I thought they were just getting their butts handed to them. 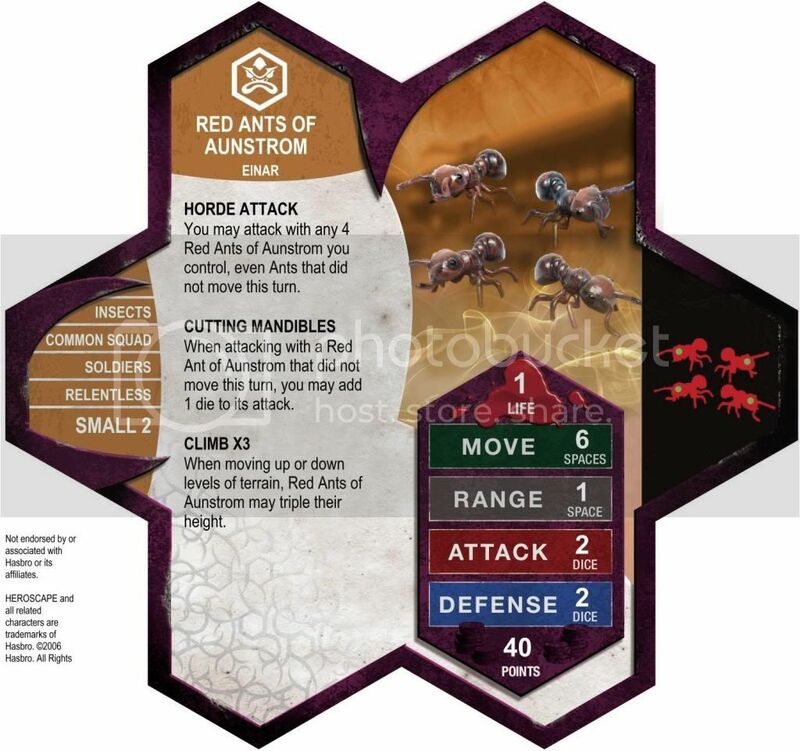 Would repainted figures revealed at the new C3V sneak peek be good proxies for the red ants of Aunstrom, or is there a lot of difference (size, style, ...) ? The two ant squads are easily distinguishable on the battlefield, but both are the same size and would be great proxies for each other. Well, Vydar broke ranks and is now fighting anyway who is in his way. (Utgar/Valkrill AND Jandar/Ullar/Einar/Aquilla).